Avengers: Infinity War is only a month away, and Marvel fans couldn't be more excited to see the climax of the series. This film has been set up for the past 10 years since Iron Man first premiered in 2008, but the most meticulous planning for the film has been the inclusion of the Infinity Stones in a majority of the Marvel Cinematic Universe films. Infinity War will finally be the culmination of the Stones' set up, with the Mad Titan Thanos finally getting up from his throne to retrieve all six Infinity Stones. 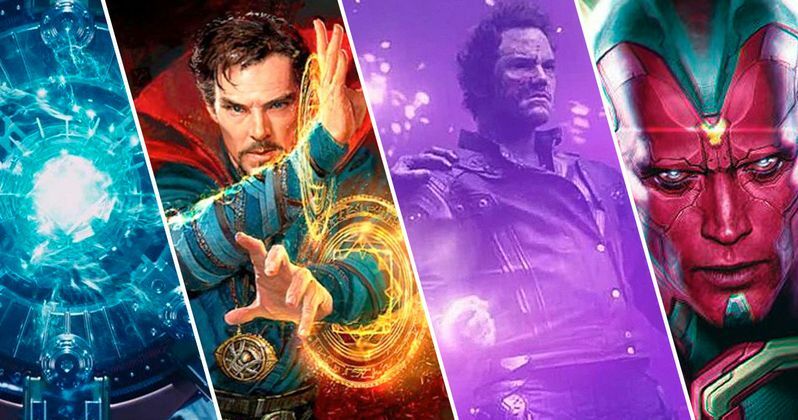 While the fights and characters will obviously be the highlights of the film, many people are extremely excited to finally see the Infinity Stones together. The Space Stone, the stone allowing the user to travel through space, also known as "The Tesseract," was the point of conflict between the heroes and villains in Captain America: The First Avenger and The Avengers, before Thor locked it up in Odin's vault in Asgard. We saw the Tesseract again in Thor: Ragnarok, where it was implied that Loki took it before Asgard was completely destroyed. The last we saw of Loki, the current owner of the Space Stone, he was aboard a large Sakaaran ship with Thor right before they were confronted by Thanos's significantly larger ship, the Sanctuary II, seemingly coming to retrieve the Space Stone. The Mind Stone, the stone allowing the user to bend the will of others, first appeared in The Avengers, which was borrowed to Loki in the form of a scepter to help him retrieve the Tesseract. When Loki failed, the scepter was taken by S.H.I.E.L.D., who in turn gave it to Baron Strucker of H.Y.D.R.A.. The scepter was taken into the custody of The Avengers in Avengers: Age of Ultron, before it was taken by Ultron, who was created via the Mind Stone. Ultron then put the stone into the head of Vision to power him. The Mind Stone remains as the "mind" of Vision today, who was last mentioned in Spider-Man: Homecoming, confirmed to be living in the Avengers facility with what remains of the team. The Reality Stone, the stone allowing the user to bend the rules of the universe, also known as "The Aether," first appeared in Thor: The Dark World after Jane Foster was seemingly possessed by it. The Stone was briefly taken by the Dark Elf Malekith before Thor took it back during the climax of the film. Realizing the dangers of keeping two Infinity Stones in Asgard, the Warriors Three, under the orders of Thor presumably, delivered the Reality Stone to The Collector. The last we saw of the Collector, his museum was destroyed in Guardians of the Galaxy. It is assumed that the Collector still has possession of the Reality Stone, despite the destruction of his museum. The Power Stone, the stone giving the user seemingly limitless power, otherwise known as "The Orb," first appeared in Guardians of the Galaxy when Star Lord retrieved it from its location on Morag. The stone was protected for centuries due to the water of the planet covering the structure protecting the stone, which is why no one had tried to retrieve it sooner. When Star Lord arrived, the tides of the planet had temporarily sank, and minions of Ronan the Accuser were close behind, also trying to retrieve the Orb. After the Orb was temporarily taken in by Ronan the Accuser, who betrayed Thanos, the Guardians of the Galaxy took it back and delivered it to the Nova Corps on Xandar for safe keeping. There has been no mention of the Power Stone in the movies since, so it is assumed that it is still located in Xandar's vault. The Time Stone, the stone allowing the user to bend time, also known as "The Eye Of Agamotto," first appeared in Doctor Strange when Strange came across it in Kamar-Taj. From that point, Strange became curious about the abilities of the stone and wore it on him at almost all times, even using it to defeat Dormammu. It was last seen in Thor: Ragnarok, still around Doctor Strange's neck in his new home, the Sanctum Sanctorum of New York City. The Soul Stone, the stone allowing the user to bend and control all life and death in the Universe, has only been seen once. During the Collector's long speech in Guardians of the Galaxy describing the Infinity Stones, it is briefly shown on one of his screens, along with the other stones. Unfortunately, no clues have been given in the series yet for where the Soul Stone will end up being in Avengers: Infinity War. All we really know about it in the Marvel Cinematic Universe is that it is orange. Many fans have come up with theories about the stone's location, but the truth of the matter is that we know nothing, and it is likely for good reason. We will know more when see all of Infinity Stones hopefully come together in Infinity War next month.